I have to credit my daughter, Sarah, for steering me to this recipe. She made them for their Christmas Party and highly recommended them to me. So, I made them for an Apocalypse Party that my husband and I attended (the end of the Mayan Calendar, end of the world maybe party. Um, that did not happen but the party was fun!). They were gone in 15 minutes. Below is the link to the recipe that I followed exactly with pictures and notes to guide you along. The only thing that I would strongly recommend is that you use Canola Oil spray on the muffin tins before you put the puff pastry in. My puffs stuck and I had a difficult time getting them out. Also my daughter and I both doubled the recipe but we used them as an hors d’oeuvre. As a side dish like the recipe suggests, 6 would probably be fine. I defrost the spinach in the microwave. I also start drying it in a colander first, pressing on the spinach until most of the liquid comes out. Then I take small fistfuls and press them between the palms of my hands to get the rest of the liquid out. This is a little less messy rather than starting out right away squeezing the spinach with your hands. 2/3 cup of well-drained spinach is what you are aiming for. The rest of the ingredients mixed with the spinach. Remember, this is double the recipe. This is one sheet of puff pastry rolled to a 12 inch square and cut into 9 even squares. Remember, I doubled the recipe, so I ended up using the other pastry sheet as well, to get 12 squares rather than 6. 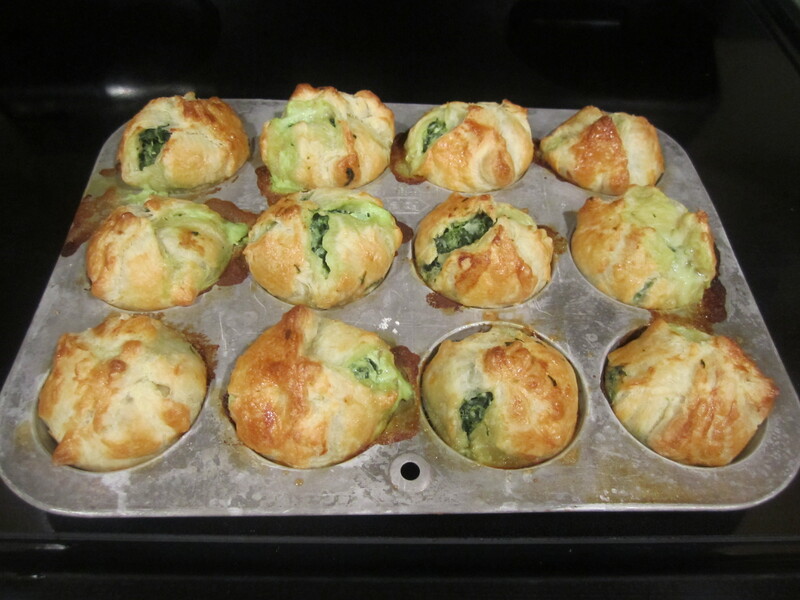 I used a scant 1/4 cup of spinach mixture for each puff and made one spinach puff at a time because the puff pastry was getting in the way: I put the puff pastry in the muffin tin (spray with canola spray first), put the spinach mixture in and then folded the pastry over the filling, squeezing the corners together to meet in center. I continued in this manner until all were complete. these were amazing. and gone in record time!